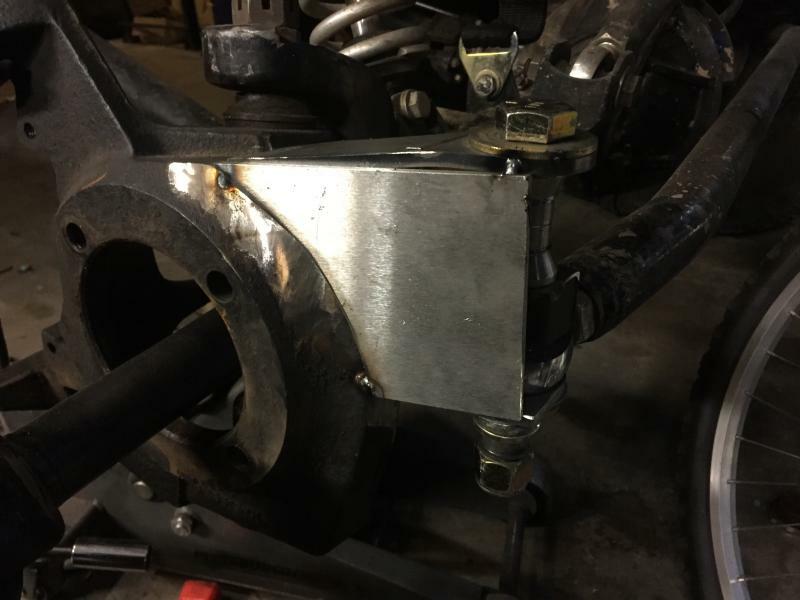 Corrected the rear brake brackets, eBay units that I had to redrill. Had RuffStuff units on here but didn't fit quite right. Oh well. Must have some weird axle alignment to the spindle index. Sprung a leak in the Griffin radiator. 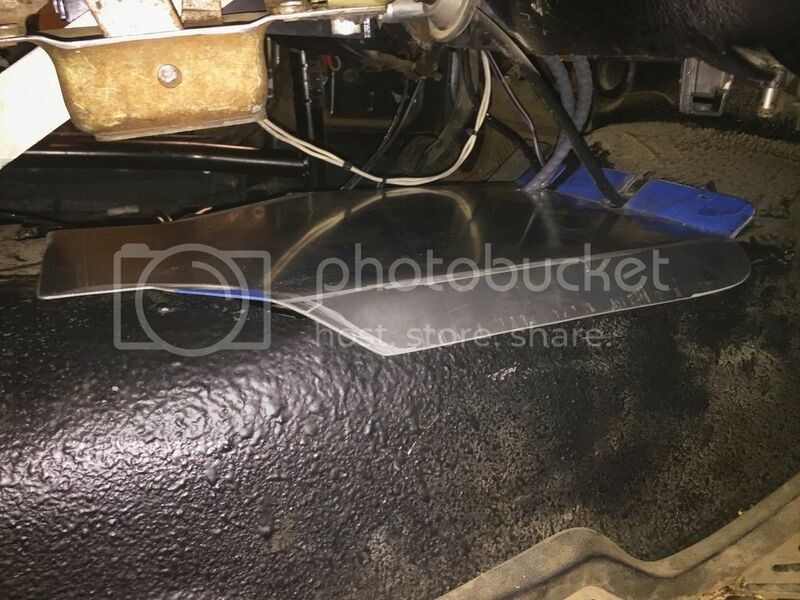 Oil cooler rubbed through. Had padding, didn't work. Might mount it some other way. Need a larger cooler anyway. Cleaned up the dash and console, but still need to narrow this console plate 2 inches and paint it black. Everything else, including the radio delete, came out well. Rewired the entire aux system for lights, horn, winch, fan, etc. Last edited by gtxracer on Sat Oct 22, 2016 10:45 pm, edited 1 time in total. Made two slim headlight mounts for 7" LED headlights with halos for turn signals, mounted two 3/4" LEDs on the fender skirts too. Really digging the look with the headlights and relocated Warn box. A gloss black wrap and paint job are in the works as well as a future LS swap sometime after KOH 2017. Those headlights look excellent. How deep are they? 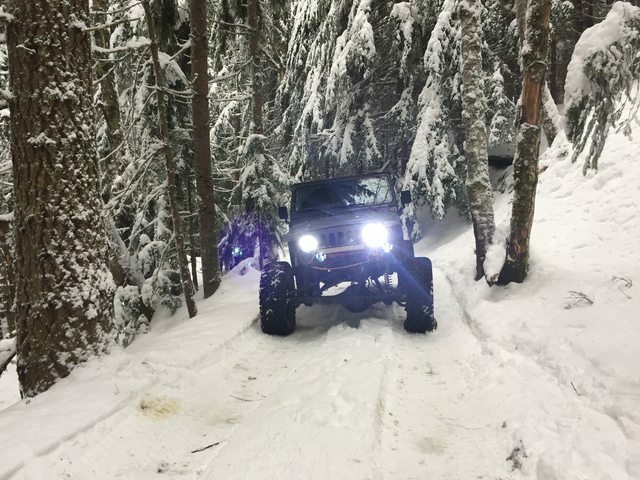 I want some actual headlights to get rid of my utility LEDs. And your knuckle pics aren't showing up. They're shallow, I'll have to measure but half the depth of the standard headlights. 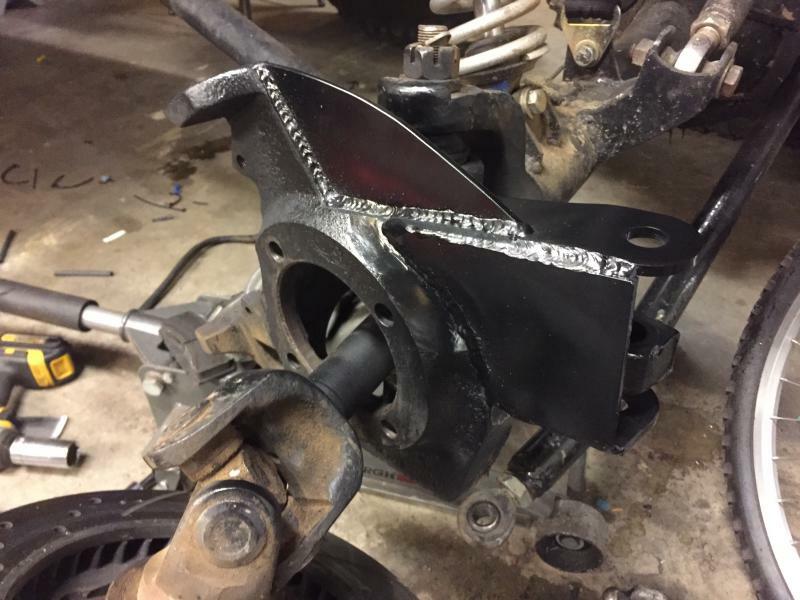 Working on the ram mount to finish the steering. Box will be an AGR 3.5 turn with the power assist disabled, servo pushing a 2.25x8 bore ram. PSC 1200x pump with a generic reservoir and an inline filter. 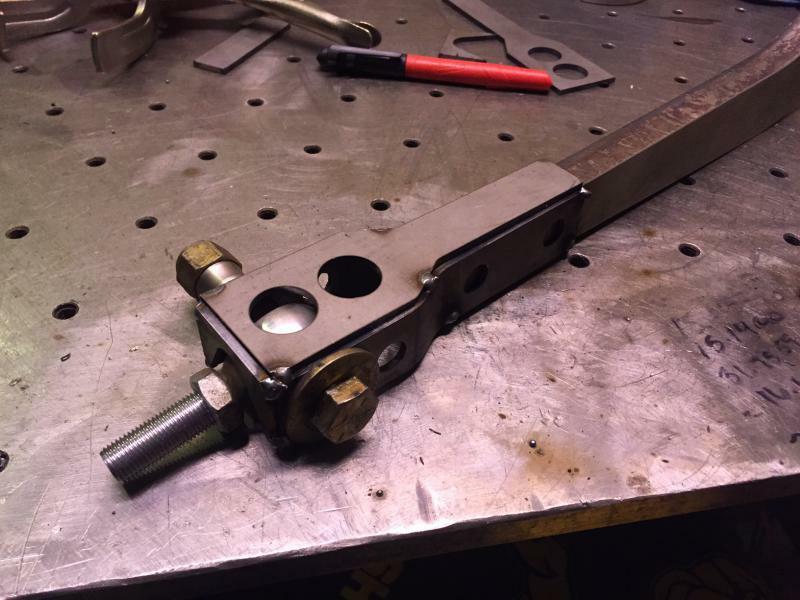 Making my own 8" double shear pitman arm too. Looking forward to it! Excited. Let me know if you end up selling your box. I twisted the shaft off my highest ratio one. I'll have at least one box that can be spared. 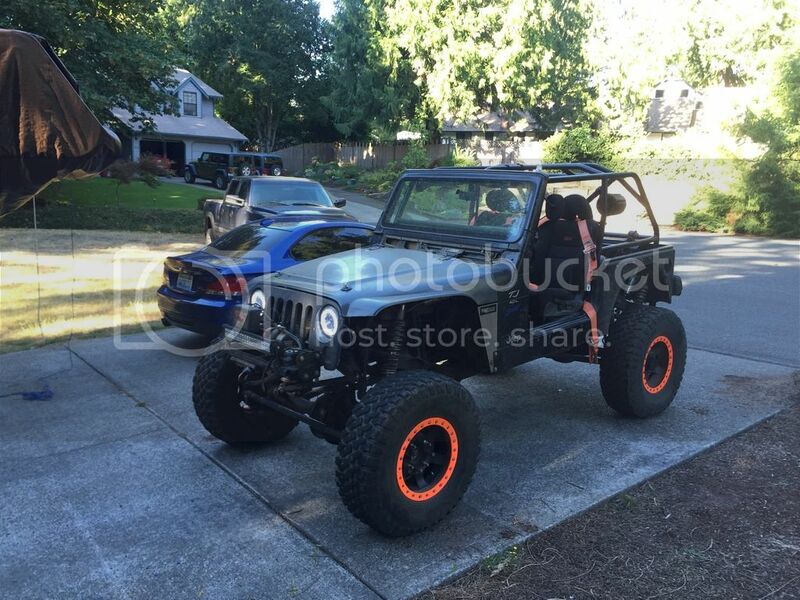 Not sure if I'll sell the PSC box, it's a good spare and I might need to throw it on Aya's jeep. But I have my stock take off box that is on decent shape. Been making all the preparations for the hydro assist. I think I have just about everything ordered. Trail Gear high pressure reusable fittings, pushloc fittings for return and feed, finned cooler, everything but the 100R5 -6 hose which I'll either order today or get from a buddy that has a hookup. 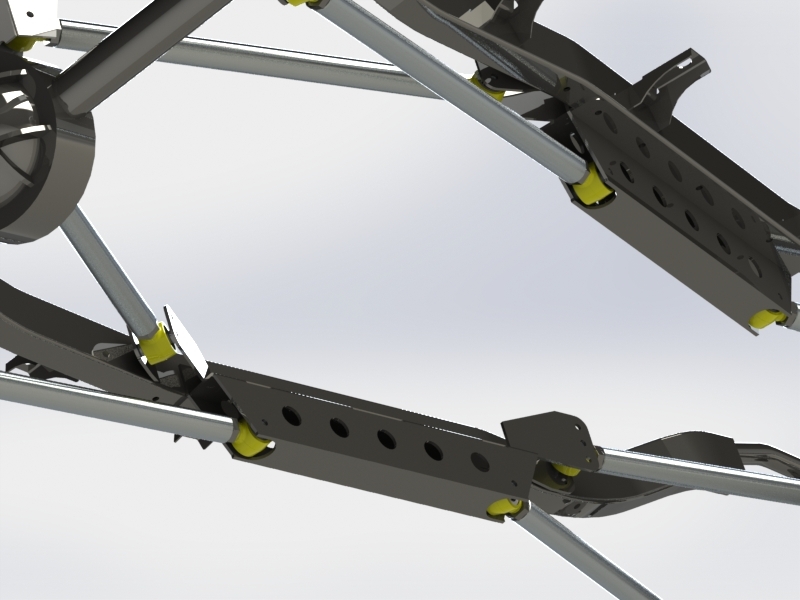 Added a bash plate for the truss. Not sure if I like the caption but it's a start. You say hydro assist, pics look like full hydro. What makes full hydro an actual hydraulic system? 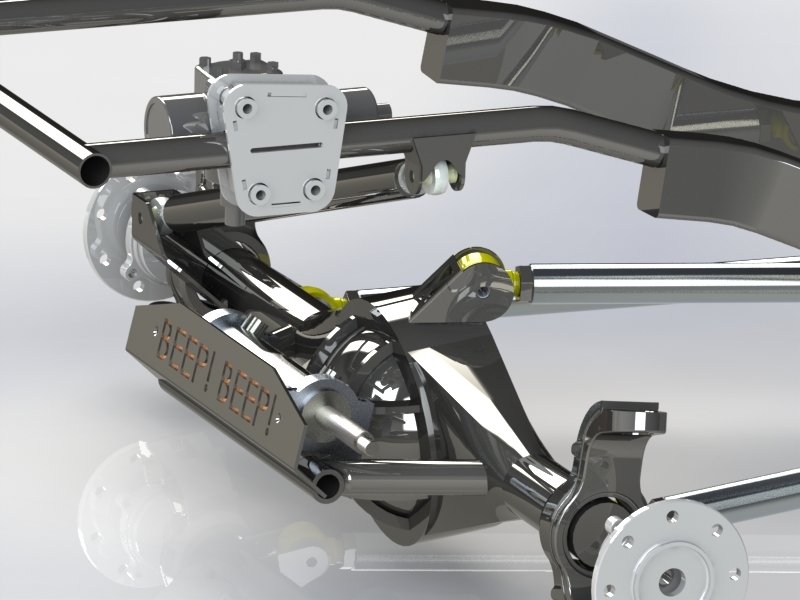 It's not the ram, that is only the driving force, the servo and lack of steering box/rack convert our hydraulic assisted steering to full hydraulic. 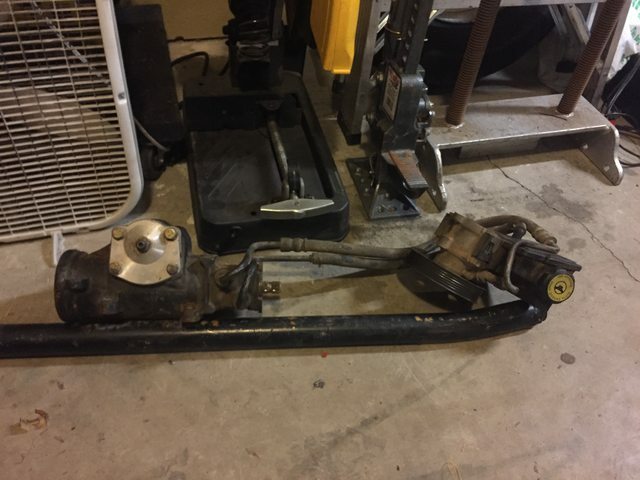 I will still have a mechanical link and steering box. This is only a beefier version of the factory system. Oh I've seen it, was wondering if that was what you were doing. I've been watching that thread closely. What do you think the cost savings is between the PBB thread set up and what you're putting together and how much more monkeying around is involved? The PBB thread is pretty straight forward with the exception of modding the piston in the box. 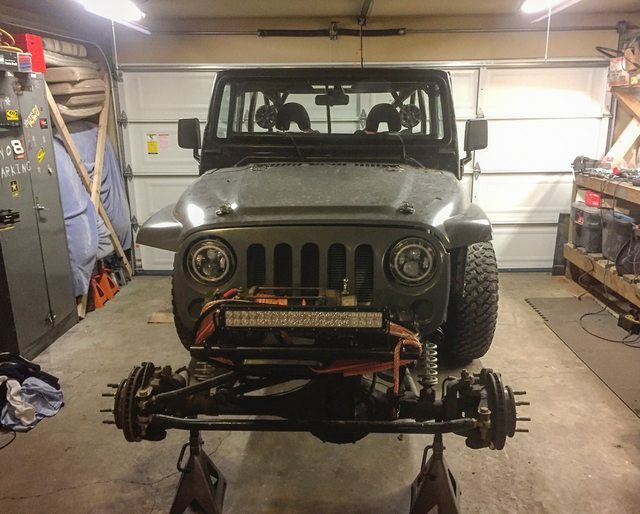 I'm starting with nothing other than a 3 turn power steering box so I could go either way easily and be the same or way less out of pocket vs a PSC hydro assist YJ/LS conversion "kit". Or buy the PSC kit, $2500ish, or the Howe kit at $2500-$4000. Not doing too bad piecing it together myself. 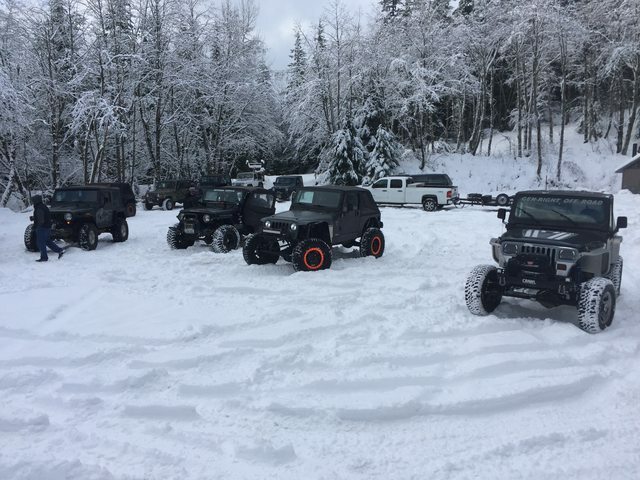 Had a blast this weekend but never going to Evan's Creek again, too sketchy for me. 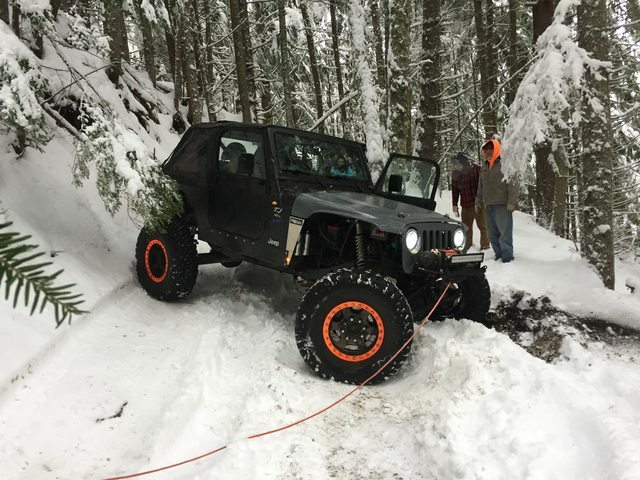 Good trip overall, just not my style of wheeling. 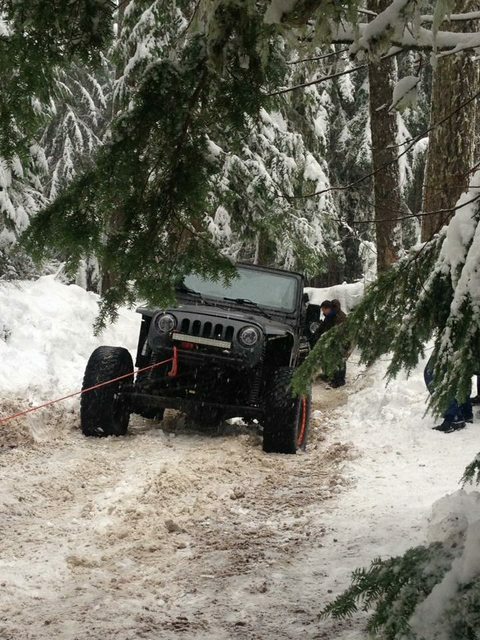 5 hours of winching and nothing but switchbacks on cliffs isn't my idea of a good trip. Great people though, which made it all worth it at the time. hah! Double Ended Ram Hydro Assist is in full effect. 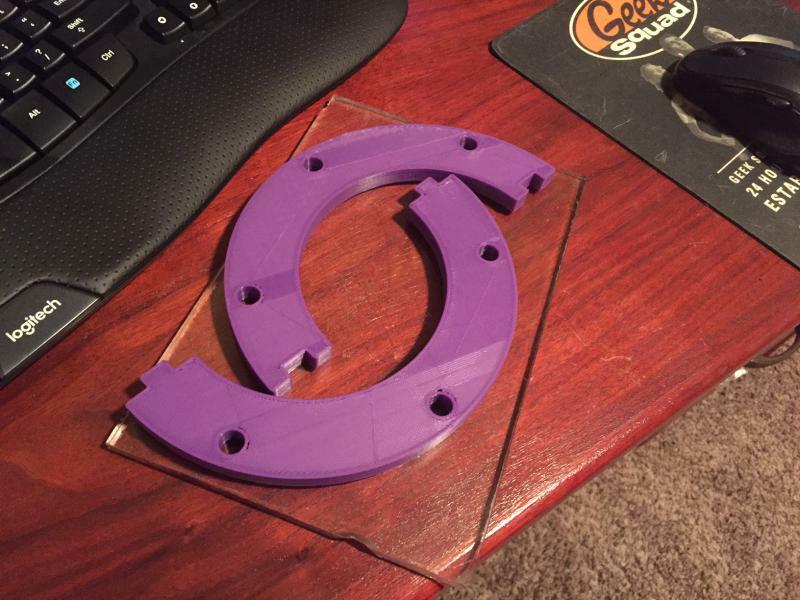 I may be moving the port location from the small 1/8" compound angle hole in the stock case, we'll see. I could also just open up the 1/8" hole. I used Surplus Center fittings that were $1 each so I ordered extras. Glad I did, the ram needed new fittings. I used reusable field service fittings from Trail Gear and bought 100R5 hose from a surplus hydraulics online store. 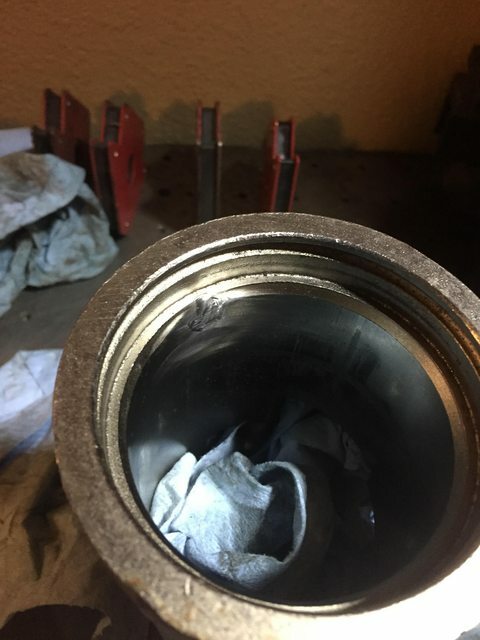 To disable the power steering in the box itself, which is what powers the sector shaft, you remove this piston, the o ring, and the teflon seal. 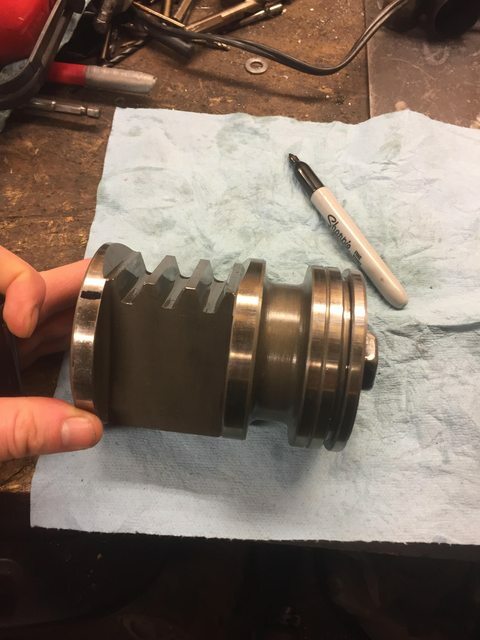 Make cuts like this, to disable the piston. I used super accurate grinder wheels and flap discs, good to 0.000001". Impressive, I know. Make a ram mount. 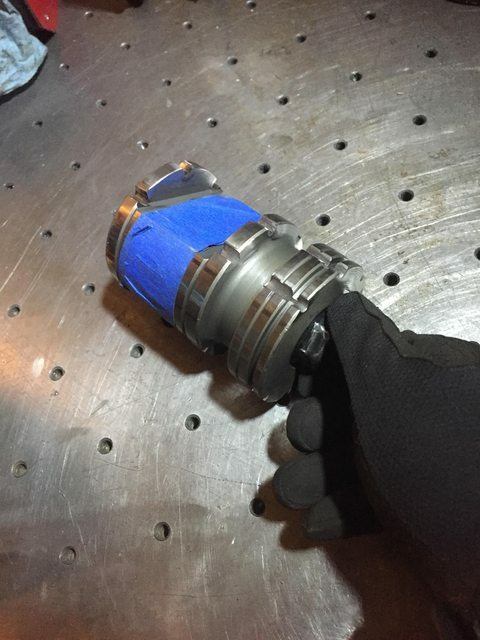 Shown is .250 wall to the axle and you can see the .120 wall for the main tube which will be sleeved with 1.5x.250 DOM and possibly some 3D printed or aluminum caps. 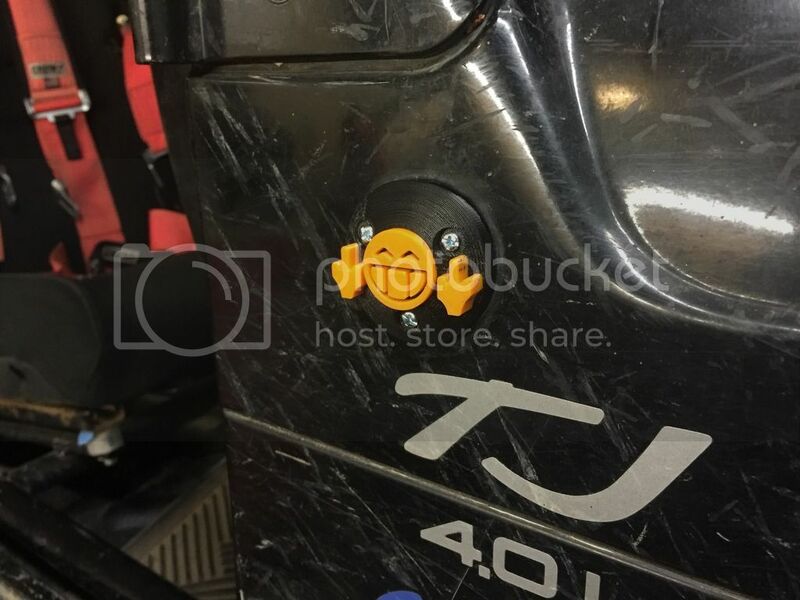 If you remember, I made the mounts for the aluminum PSC clamps and they work very well! Weld up and smooth this hole, it's just behind the front cap and retaining clip. This will fully disable your power steering to sector shaft. Do not do this if you are just wanting to port your box for hydro assist. 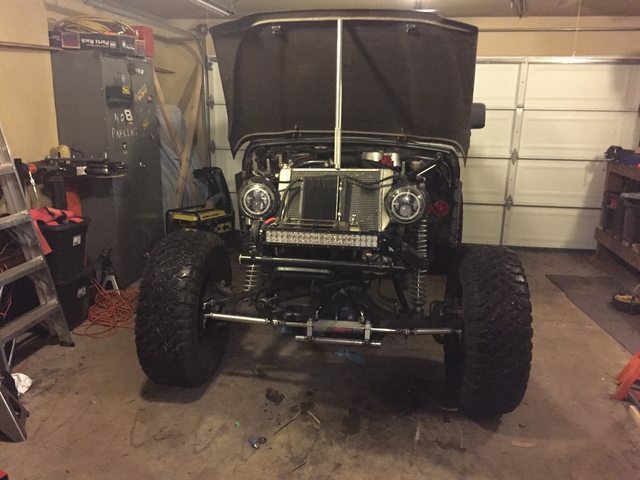 Forgot to post a picture of the Jeep in the garage, so here it is, randomly in the middle of how to tap your box! Mark and drill your holes. As you can see, the top hole on the milled flat section goes straight through. I put it right on the center of the casting and in the center of the milled flat. It doesn't necessarily matter if you hit center on this hole, so use it as practice for the lower hole. 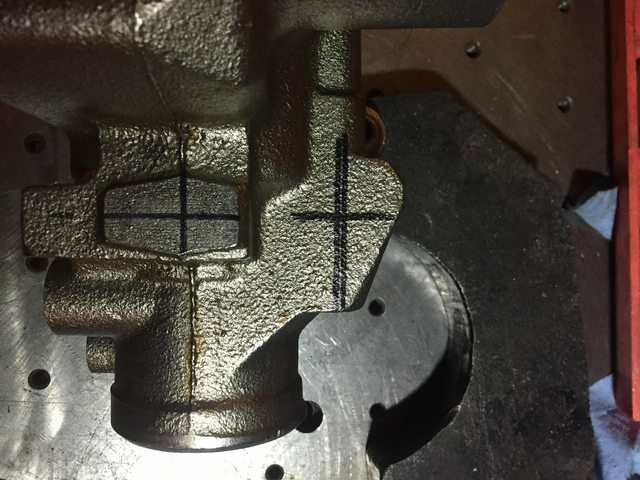 On my box, there was a casting mark for the lower port but you can see the port running along the box perimeter/profile. 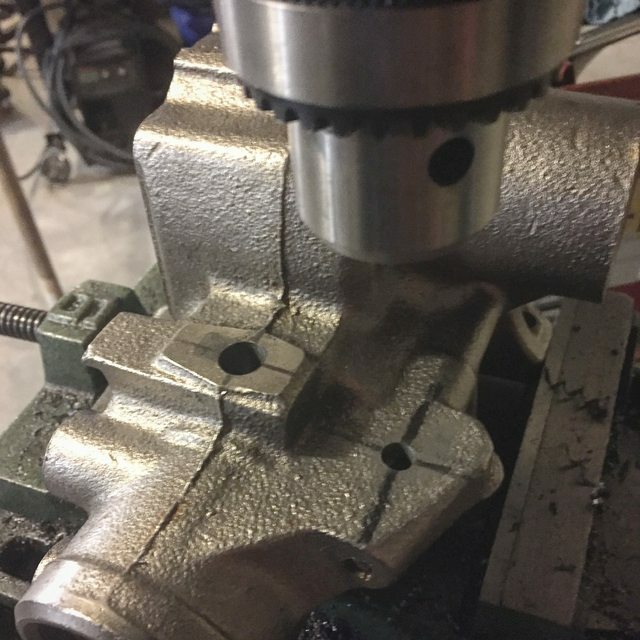 You have to cut your hole as close to on center as possible. I hit it DEAD center and must have lined up this drill process 12 times before actually drilling. I used a large drill bit to make the start mark then a small 1/8" drill bit to actually punch through and check depth. A drill press is a must here. 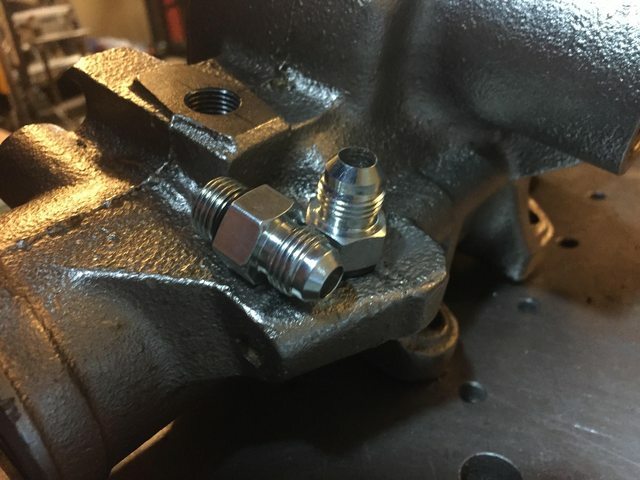 The surplus center fittings I used have a JIC 37 degree fitting on one end, which is the flared end you see, for the Trail Gear and most convention fittings for hydraulics. 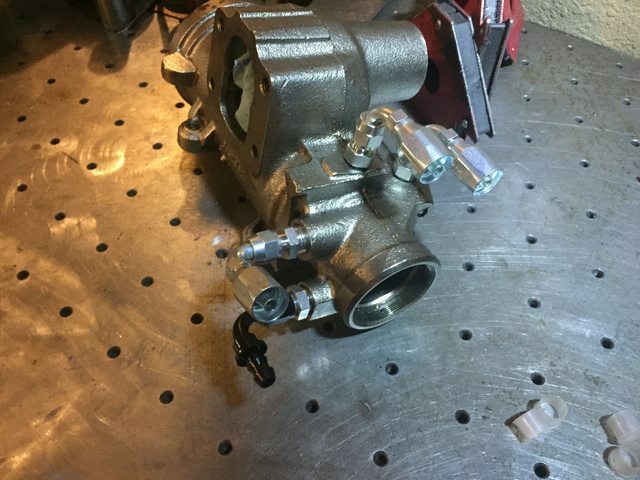 The other end is a SAE 6 fitting. 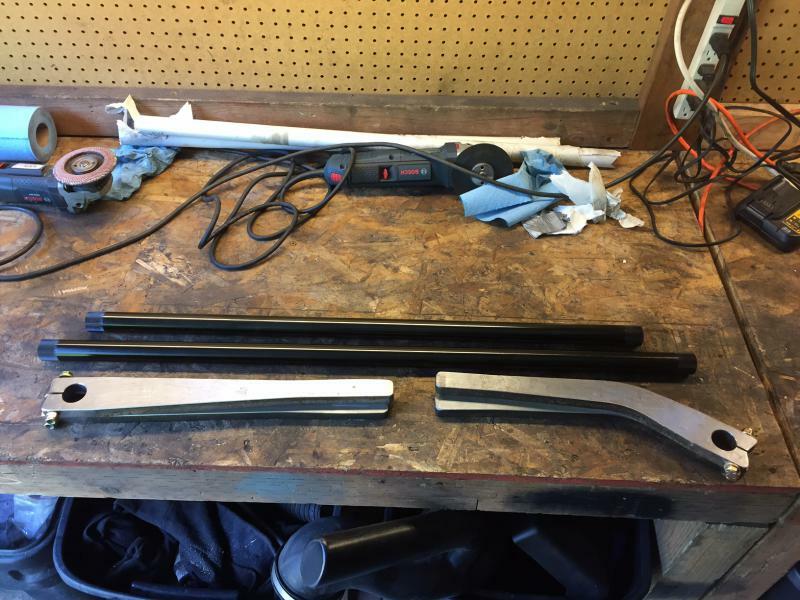 You torque these to 40 foot pounds (ft lbs). Their threads are 9/16-18. This is NOT NPT!!!! The O ring on these is just under 5/8" at 0.620" in diameter and you must give it a 0.080" counterbore for the o-ring to seat and seal. 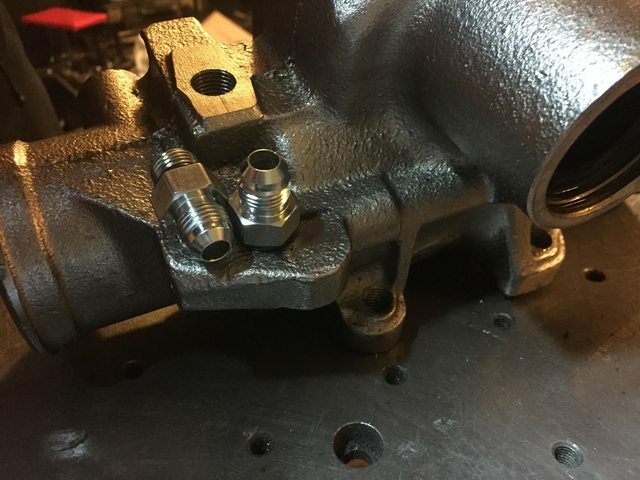 Remember, you can also weld these fittings to your box if the threads don't work out. I may just do this to ensure a tight seal. The pump and system operates at 1400+ psi, so you want a good seal here. I used a 5/8" flat faced end mill but I think a 5/8" drill bit could be used. 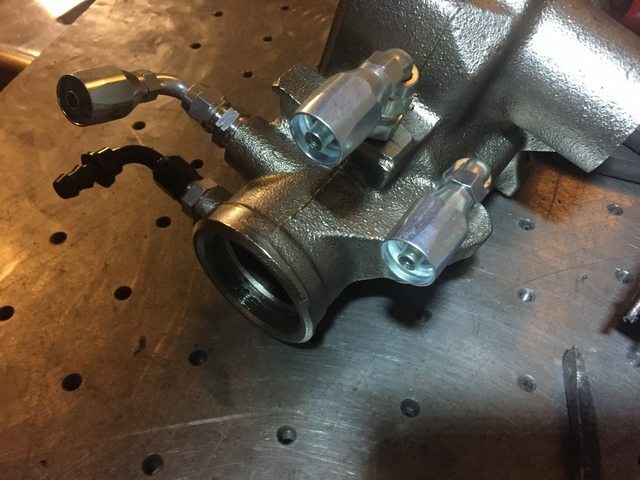 All said and done, with all the fittings, it should look like this. The black fitting is a standard push lock fitting from Amazon. I used 16mm and 18mm x 1.5mm to JIC adapters to go from the box to the other fittings. All in all, I think a good budget for fittings, hoes, and misc bits for this is around $150. That's where I am right now. I wasn't sent enough 7075 for the steering links so I may have to make one out of 6061 for KOH. I have just about everything else needed to make it all work. I'll post up more after the weekend. I have mounted my new pump, reservoir, cooler, and filter but need to take pics. I may be modifying the box for the bigger port, we'll see what I do. I don't want it to be slow so I am going to have to do something to improve the flow. 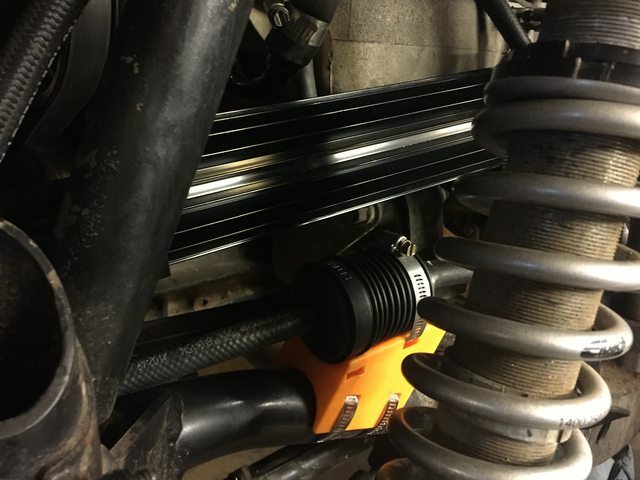 Redesigned the front track bar setup, this will allow me to run a front sway bar, which I really need. 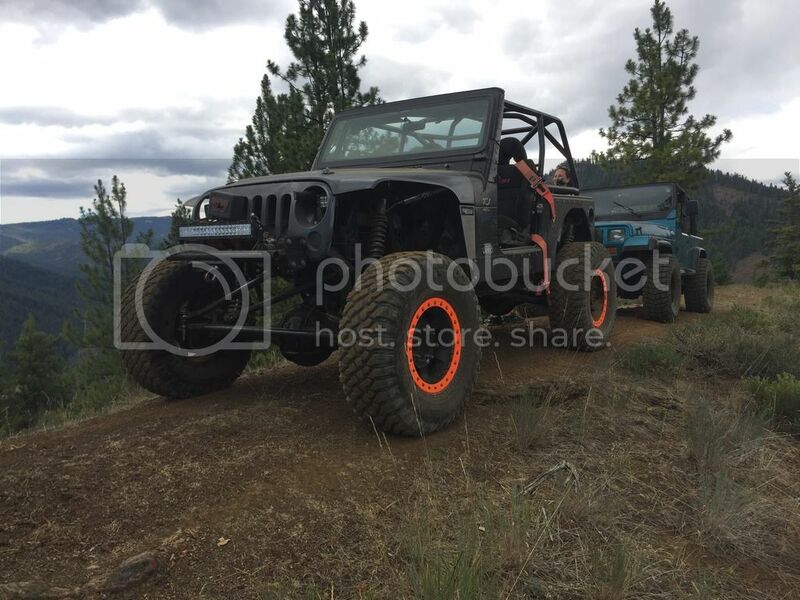 Found a 32" .7" OD Currie sway bar in the classifieds and I'll run that for now and see how I like it. I think I'll want stiffer bars, but we'll see. The steering system WORKS and works WELL!!! I haven't had the tires on it yet since I had to yank apart the box again, but overall it's great so far! 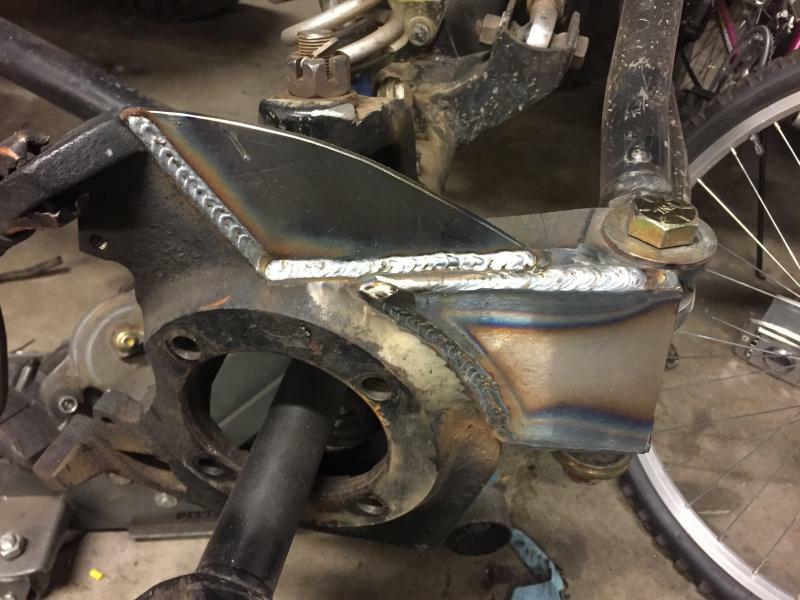 Tie rods are 7075-T651, all RuffStuff heims, made some stainless spacers to use 0.625" bolts in the 3/4" bore of the 7/8" heims. 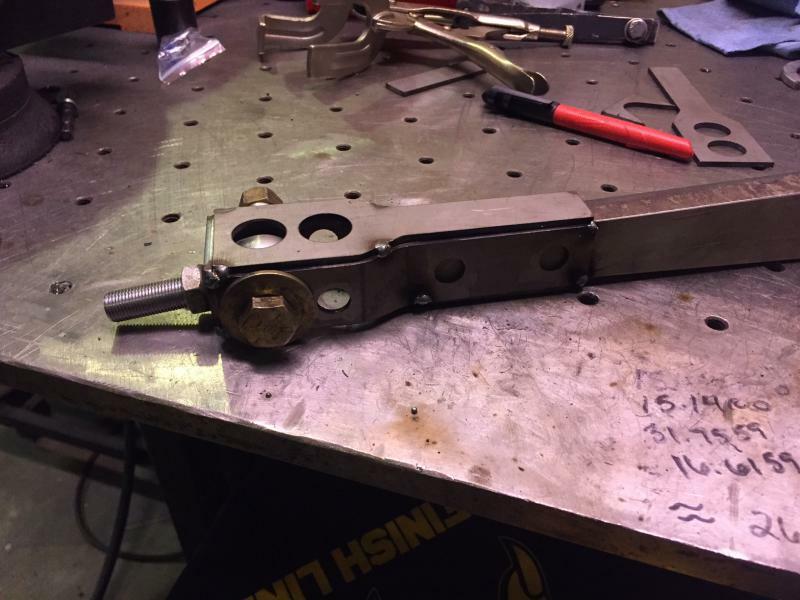 Milled out the aluminum clevis on each side to accept the larger heim. All new AN hardware and 100R5 hose. 3D printed a filter mount and welded a tab for the reservoir. Running a 12 or 15" cooler (can't remember which) and it all works well together so far. Box had an issue, I think I smash the sector shaft bearing so it was puking fluid when I would turn full left. 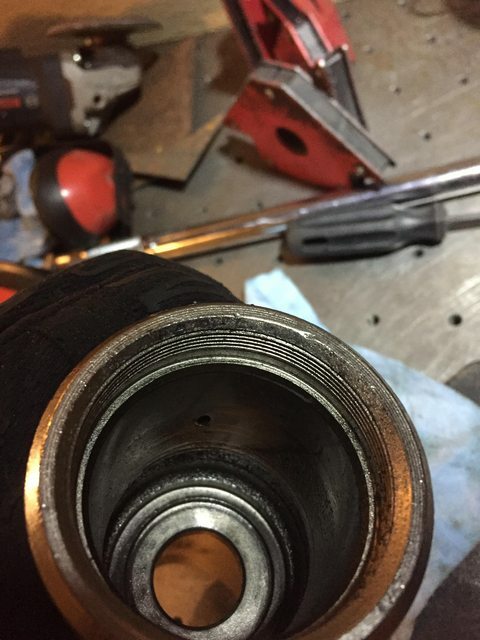 Pulled the bearing out and it's seized and oversized from force. Probably me hitting it with a socket in place. New one on the way, 1-1/4 ID, 1-5/8 OD, 1-1/4 width Koyo 2020 bearing part number. Video of the issue, this was just before I put the tires on and drove. Hard to steer to the left. I am not sure what happened, maybe one of the balls fell out or a piece of metal is in the path, I may have to take apart the box again. As some of you know from IG, I've been slinging together a new link mount system. I've also been modeling the Jeep in it's current state, as much as possible. 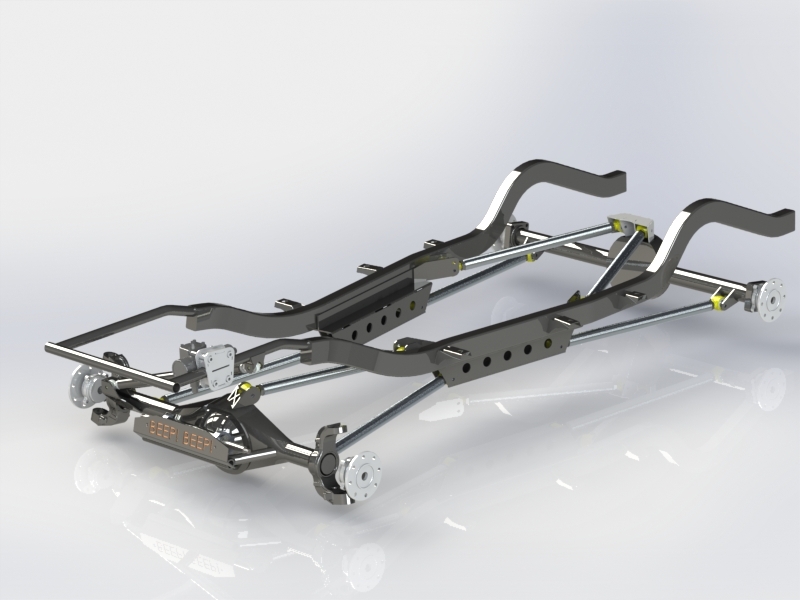 I'll probably make this a kit for anyone wanting to have a front stretch, new box location, rear stretch, 7-9" of uptravel front and rear, and excellent link geometry for go-fast wheeling. 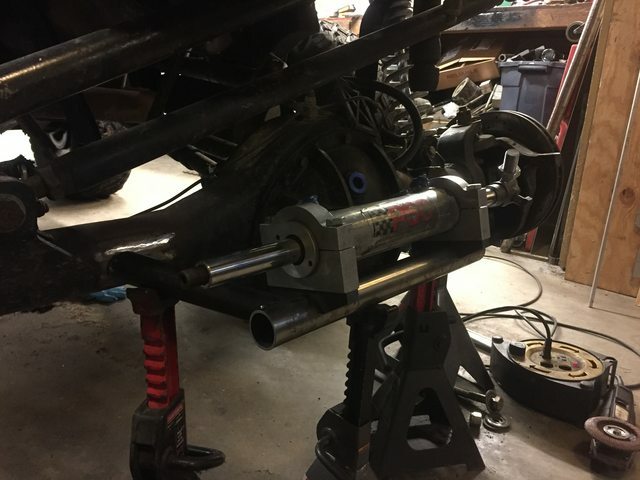 This has my new track bar and front frame as well as the steering box mount and the hydro ram mount. 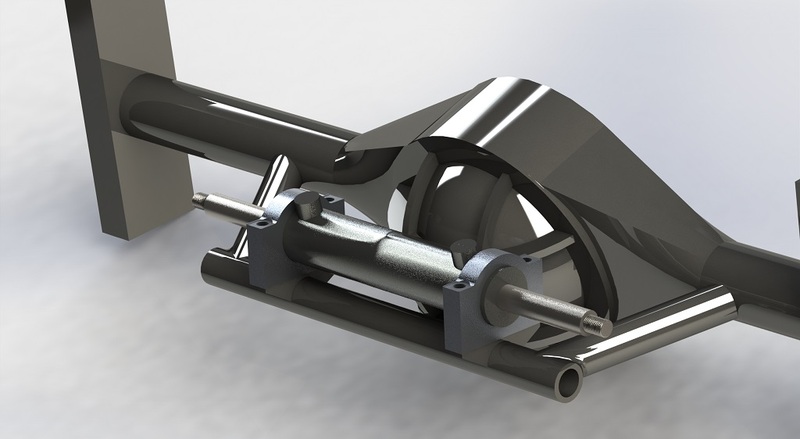 More to come, I need to actually design the axle housings that will maybe/possibly replace these Eaton/mockup housings. 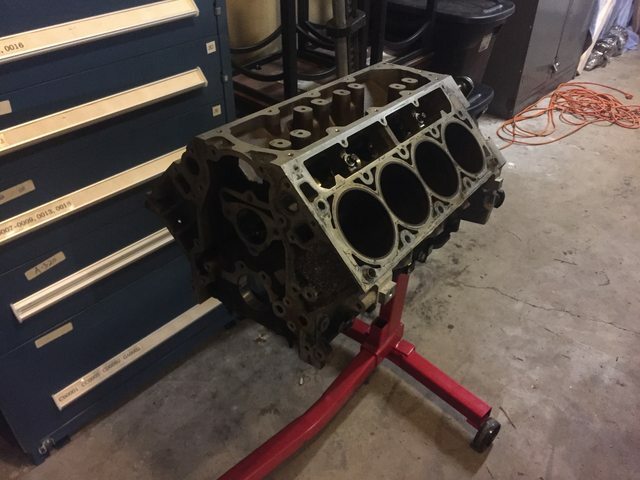 I sold the LS2 block to get something more complete. The price different between GenIII and GenIV stuff is still too high. 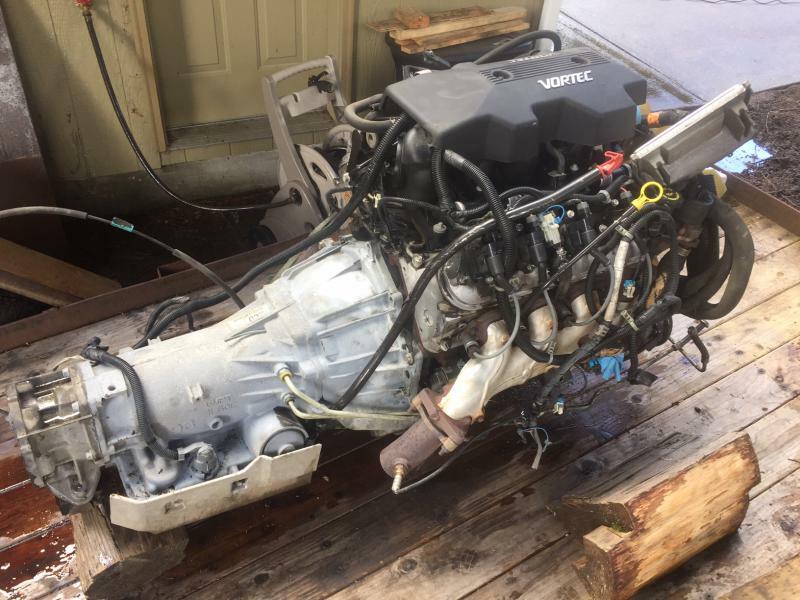 I did find a complete 6L80E on here for $500 but the remaining pieces would put the swap well above $6k. I want to do it for $3K or less. If I really feel I need more than 400 crank HP, I'll go find a 6.0 block and LS3 heads and intake. 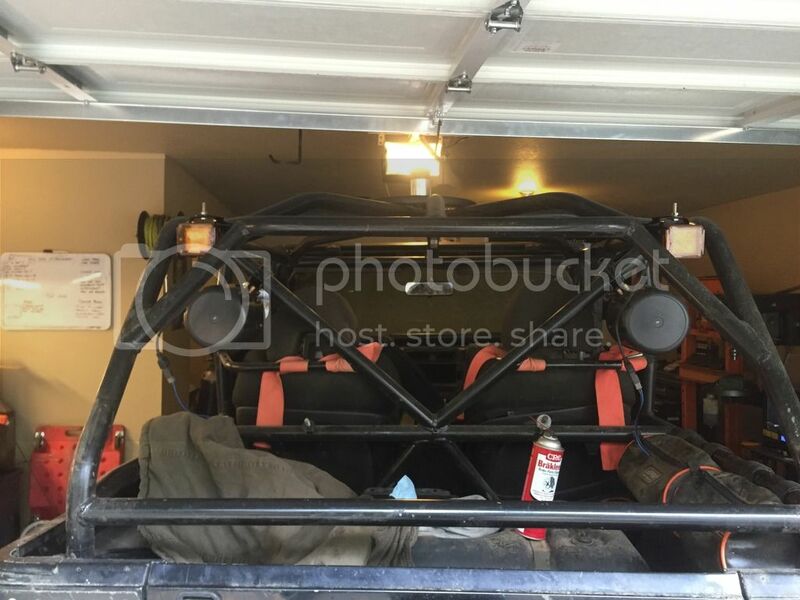 For now, I found this 2002 LM7 complete with 4L60E, harness, computer, and all accessories. Dirty, but complete and a good deal. 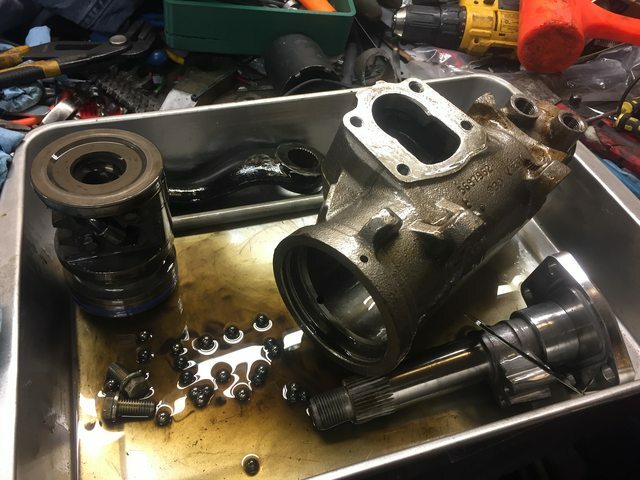 My cousin's husband is handing me an L33 aluminum block 5.3 that needs 1 new piston. I'll be cleaning that up and using most of the parts off the LM7 to make a complete HO 5.3. 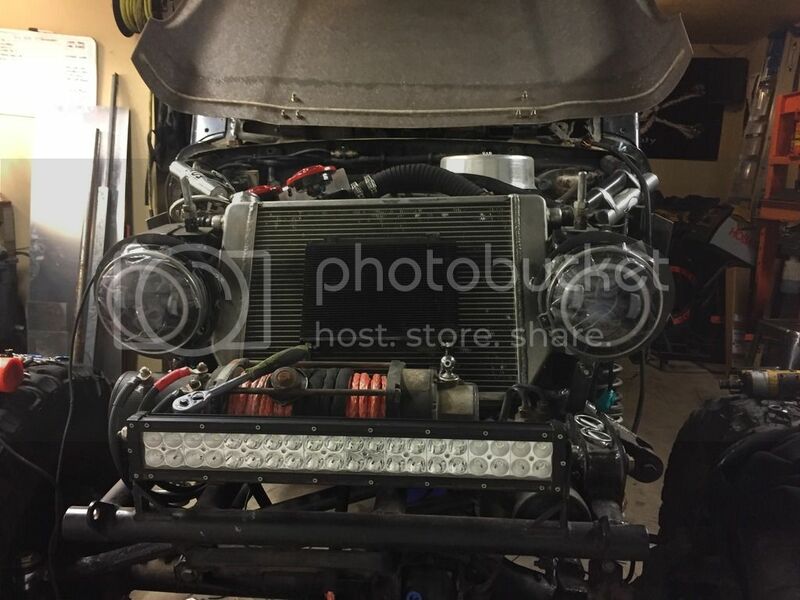 Adding a decent cam and possibly LS6 heads. We'll see where it takes me. Swap will take place this fall and winter. 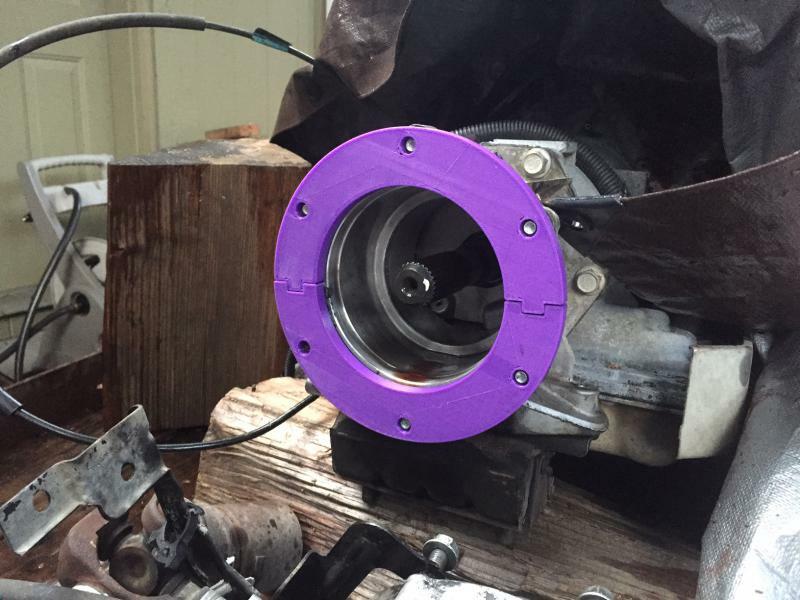 I 3D printed the alignment ring and jig to compare the Chevy bolt pattern to Dana 300. 1 bolt hole does not line up. I will make this work, I think I can mill the hole out enough to get the clamping pressure and rotational shear strength I need. If anyone wants the STL or SolidWorks file for the ring, PM me. It's spot on. 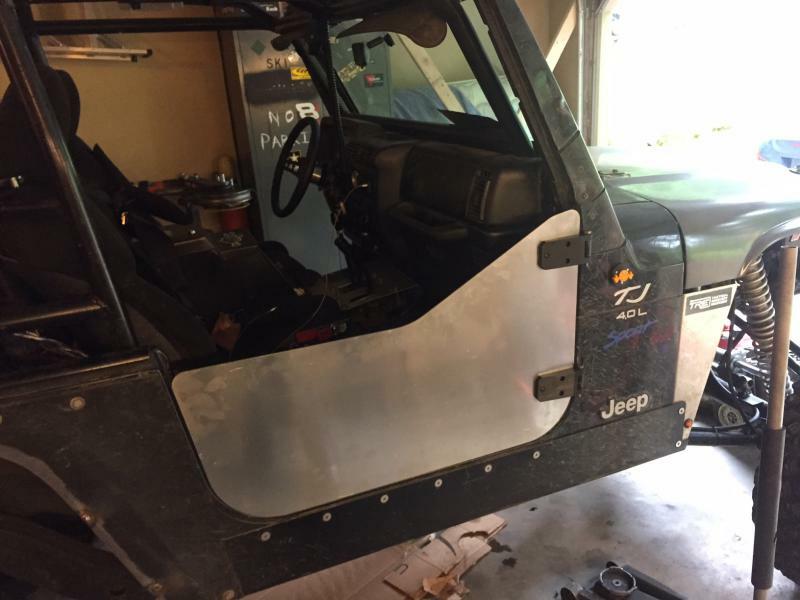 Onto the next project for the Jeep - deleting the fuel tank filler and finally cutting the rear corners to match the front. This is overdue by nearly two years. Whoops. I cut out the fuel cell filler plate and it fit like a glove. I can grab pics of this, it's on IG. Laser cut and it slipped right into the Rokmen corner armor that I purchased almost 7+ years ago. If anyone needs the file, PM me. The rear of the corners look funky to me but they're also growing on me. 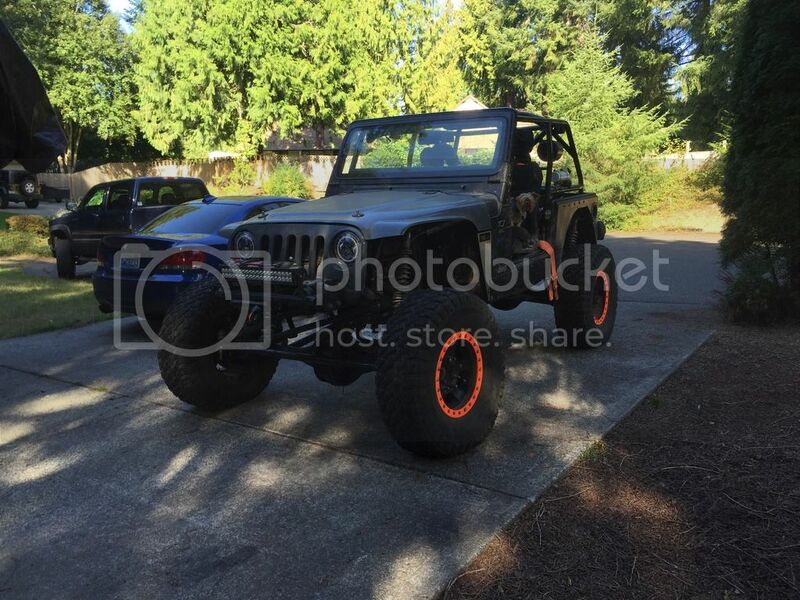 I also bought a 3M wrap for the Jeep. Once I paint over the current raw steel and prep the fiberglass and tub, it will be going on. 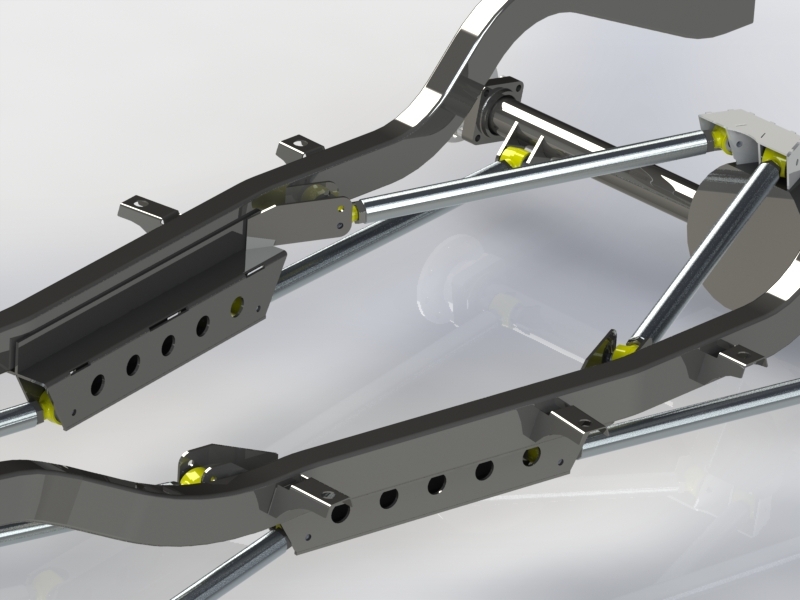 The next alteration for summer wheeling was the front track bar. 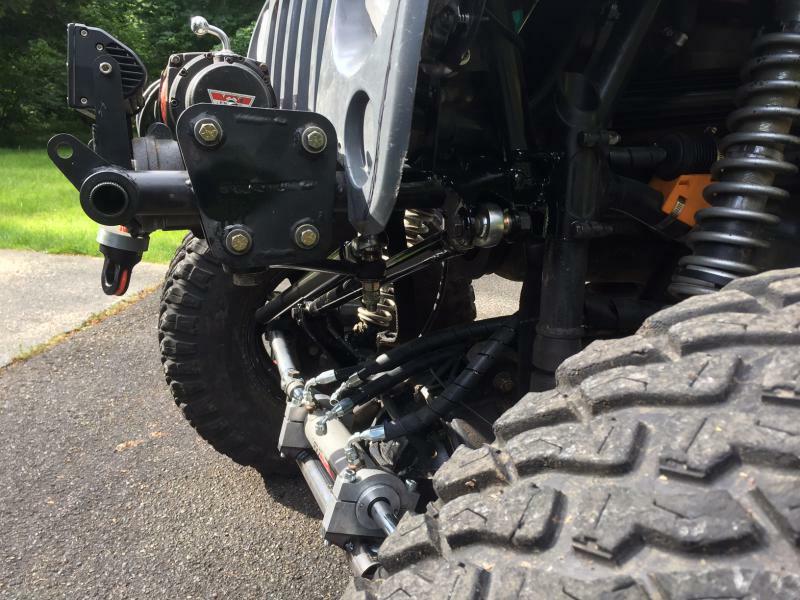 I've had some death wobble and bump steer since I installed the new Eaton axles. I lined up the angles and distances when I was building it the first time, but somehow the track bar came out 3/4" shorter. This has a decent effect on handling. The mount was also very long, so it stuck out of the frame a bit. 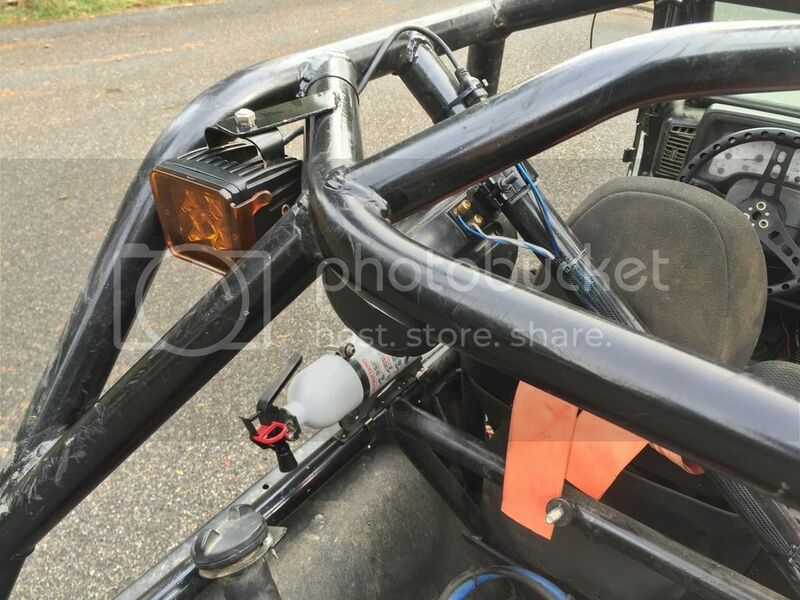 I wouldn't be able to install a sway bar in the front and the mount was flexing. Eventually it would rip off and tear the frame I had built, so the Hypertherm 65 came out and I cut it all off. 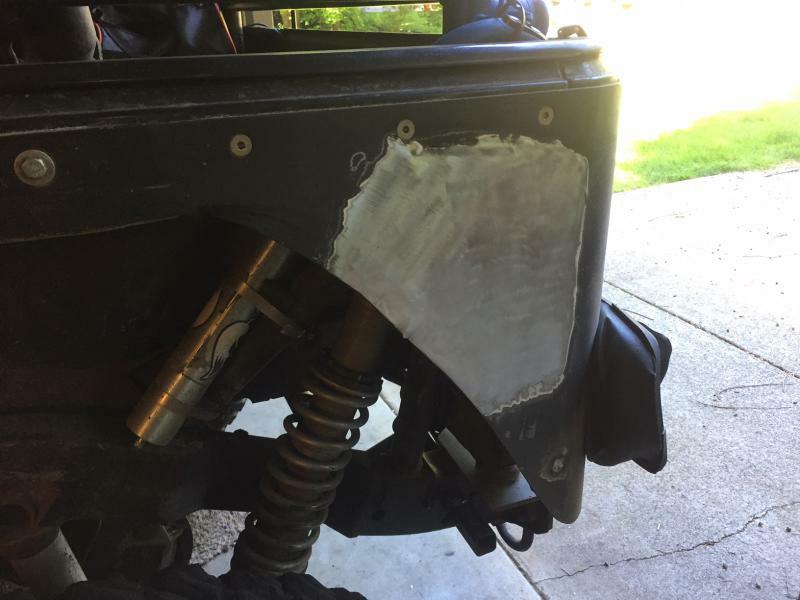 Hurleygo3 had a similar issue with his track bar ripping off, so that was the final straw to changing the design. The new one is much closer to the frame center line and much stronger. It also has the corrected geometry and is accurate to within 1/4 degree. 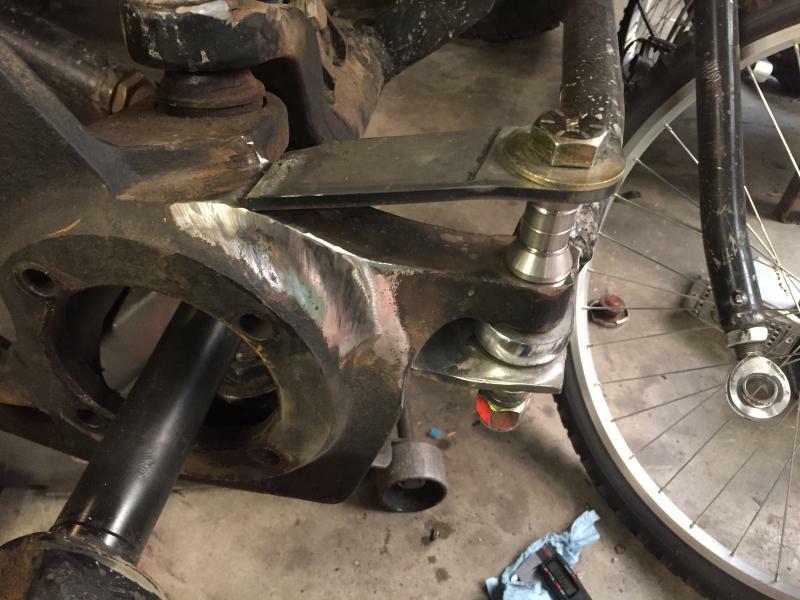 I had to bend the drag link a bit to get it to clear the new axle side mount. 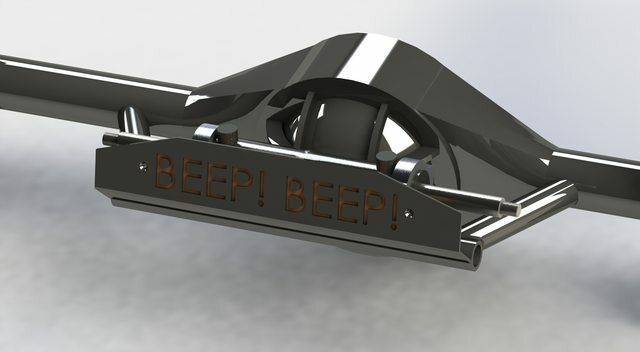 All of this was designed in SolidWorks and laser cut. 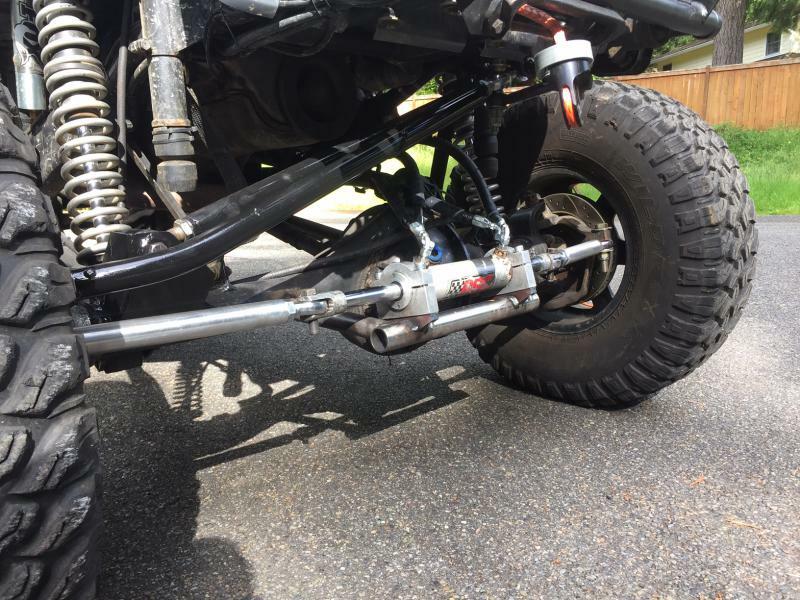 Once I lower the suspension 2-3" the angles will be much shallower and the steering will be happier. I'll do this when I drop in the new drivetrain. 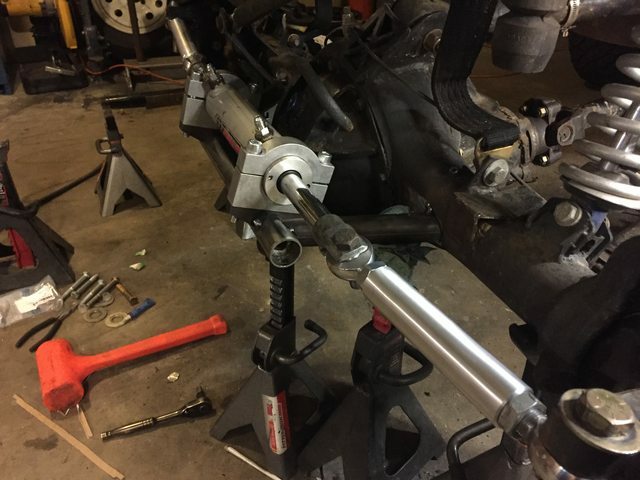 Steering is still coming along, I think I have it mostly dialed in. Even with just the new track bar setup and PSC pump, it steers much better. But the DE hydro assist is what I'm after, and it's AWESOME when it's working. Also, some of you may notice that all my tires have matching tread now I have 5 good Falkens finally. 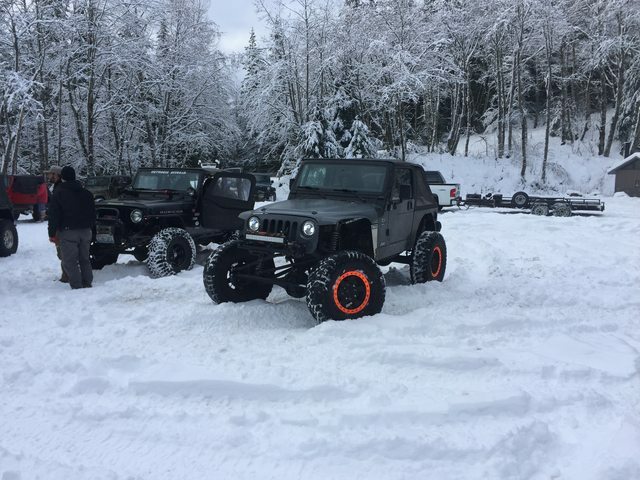 Good tires. I have the MT01 "sticky not sticky" compound. Thanks John! 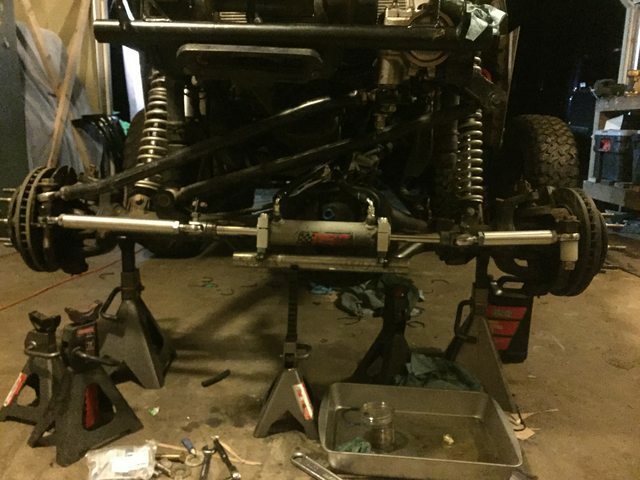 Next up was the sway bars. 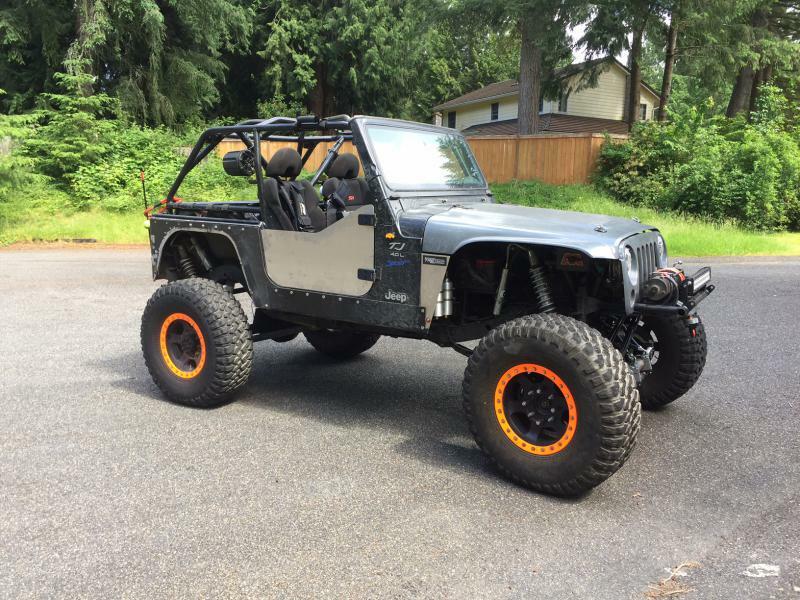 The rear antirock was actually a TJ front antirock. It worked well for what it was and what I was doing at the time (crawling), but there's no way it would hold up to Ultra4 style abuse and go-fast. 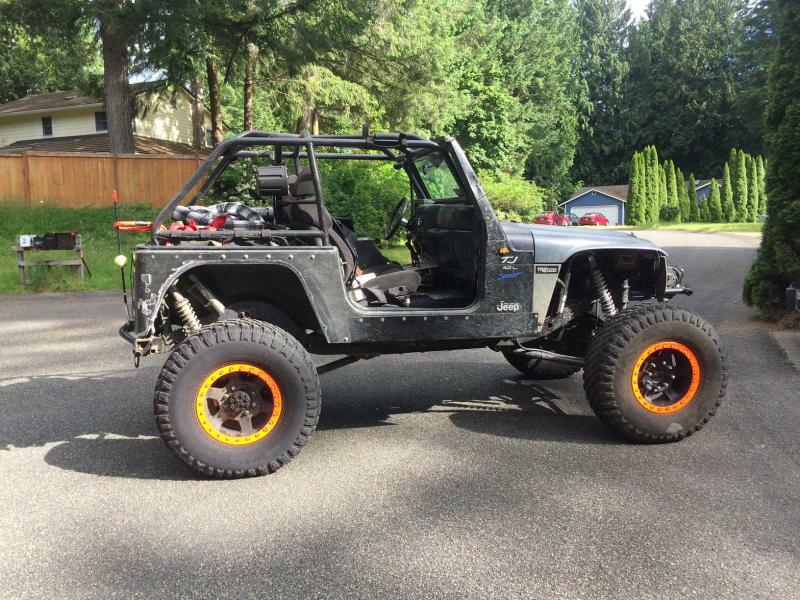 I want to race this Jeep locally next year and that requires some better sway bars with higher spring rates. The Currie Antirock spring rates are somewhere between 35 and 75 depending on where you mount the links on the arms. 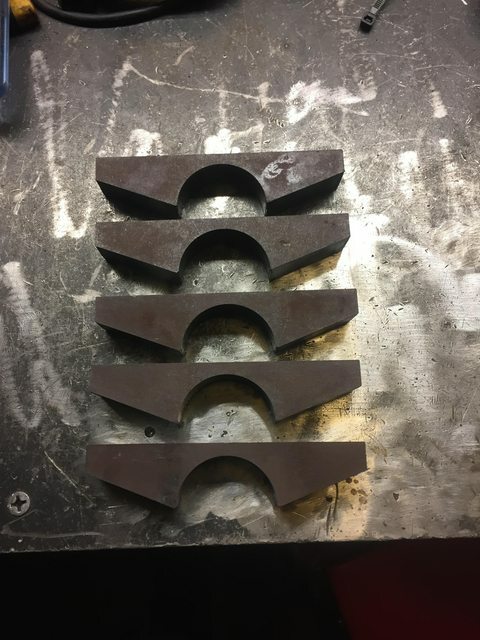 This is with 14" or 15" arms, center to center. 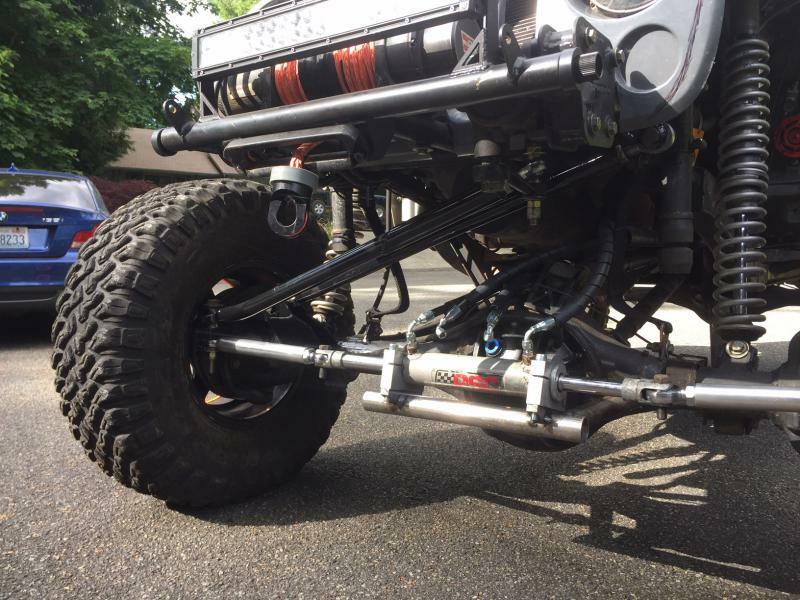 I am now using 17" to 19" arms (adjustable) with Coleman Racing sway bars. I use 1.25" bars with 1" ID to get a spring rate between 125 and 150, adjustable. I can go a little higher if I play with the distance from the arms. I'm planning to make the rear a little higher than the front, to allow a little bit of oversteer. I prefer this to sliding off the track with understeer. 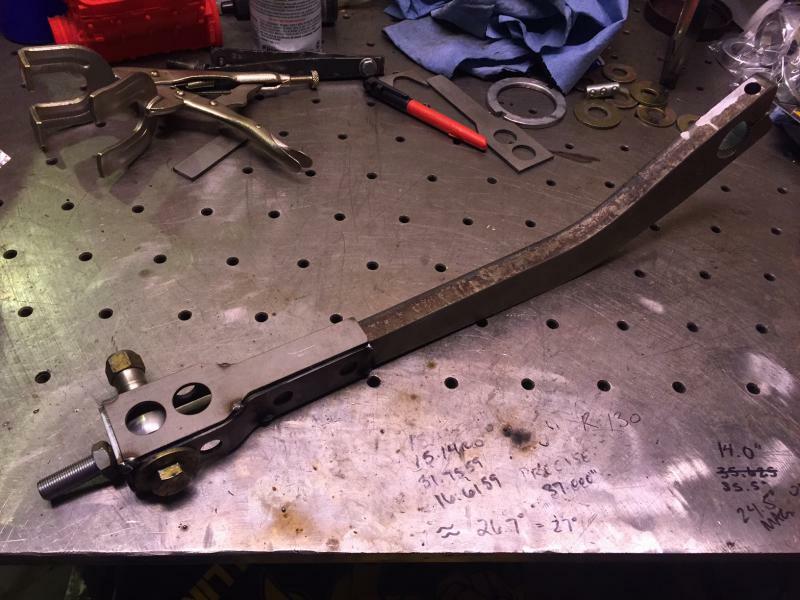 Links will be 1" 6061 with 1/2" heims, double shear at the axle, double shear on the front arms, working on a double shear setup for the rear arms once I decide on length and dial in the rate. Lastly, which brings us up to date, I wanted trail doors. I like the Savvy doors, but don't like the price. 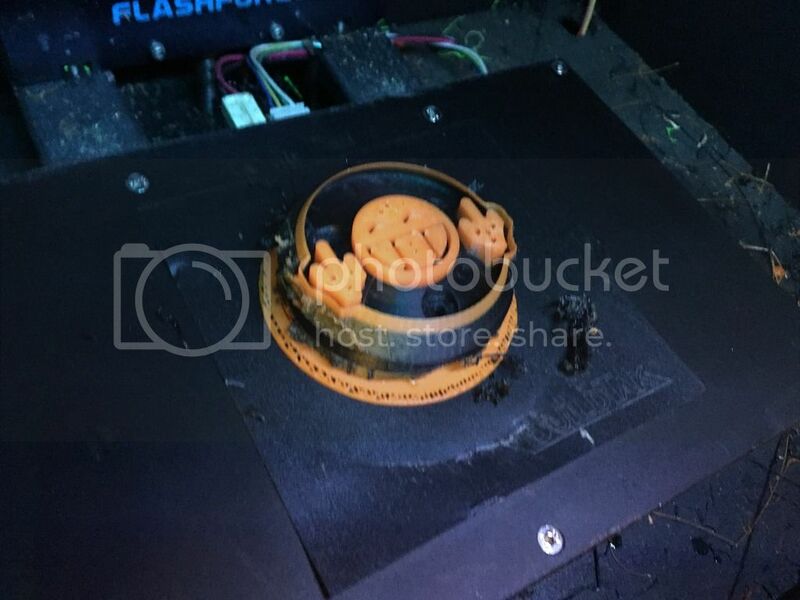 I also wanted to experiment with the strength of the new materials with my 3D printer. I have some Carbon Fiber Nylon from 3DXTech that has proven to be extremely strong. 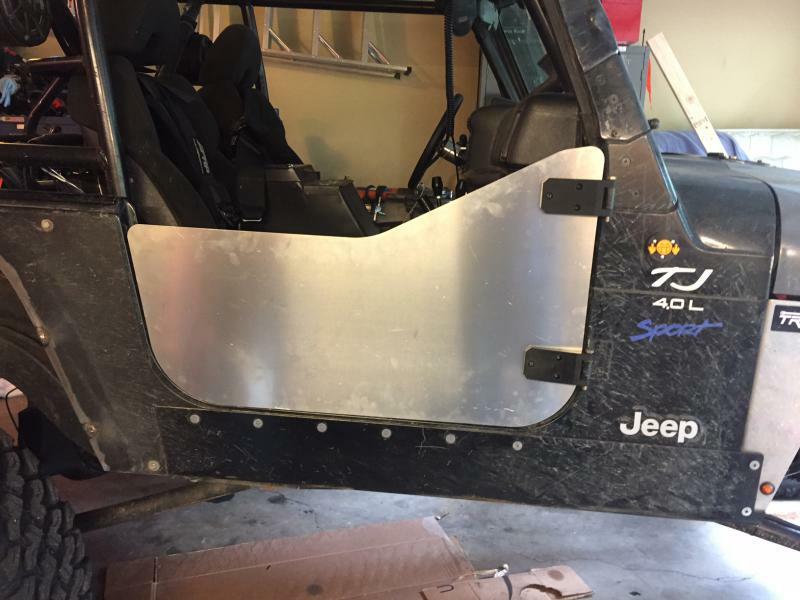 I designed a half door setup with 3D printable hinges and levers with 1/8" aluminum skids and 1" square tube supports and stiffners. Cable actuated through a couple of hot rod door locks. I'm still getting these dialed in and printing the last of the blocks I need to space the locks into place, but the profile of the door and the concept has come out nice. Doors swing easy and the hinges seem to be pretty strong. The hinges seen here are just PLA and they're plenty beefy. I don't think I'll have any issues until I run into a rock. These are printed in a manner that aligns the grain of the layer perpendicular with the force, so the layers do not separate upon impact. I have a buddy with a 1" square die, I'll be bending these soon. I'll also be designing a new subwoofer box, might use a small 8" woofer that's deep instead of the shallow 10" I have now. 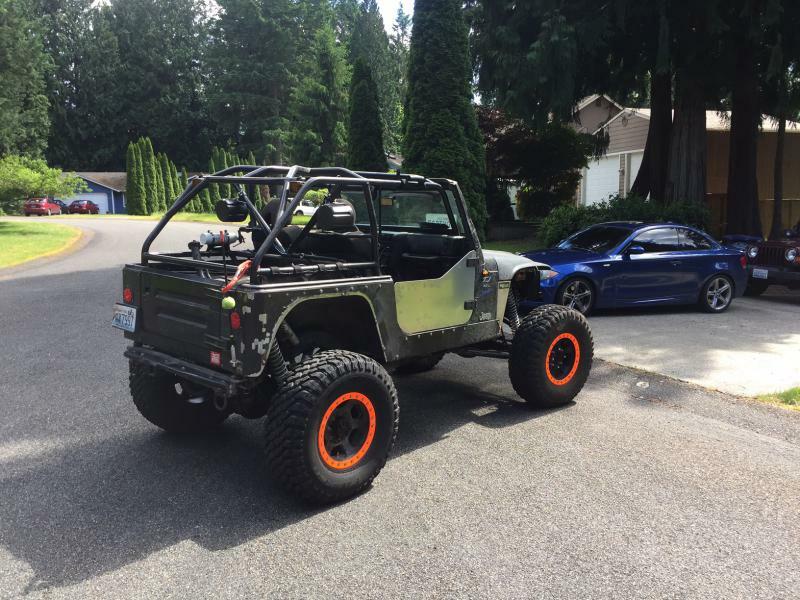 Once that's complete and I have the wrap in place, it will be a new Jeep. Center console is getting cut down and replaced this winter. 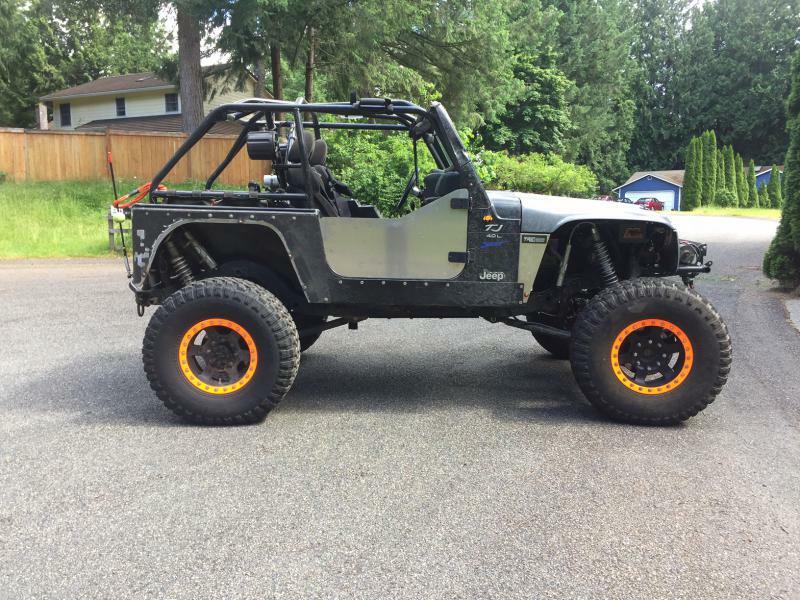 Have some suspension seats to throw in as well. 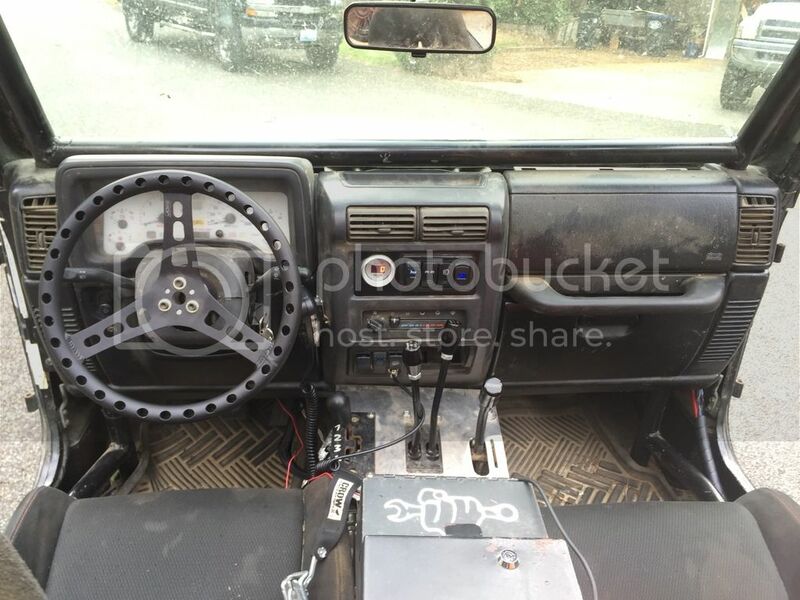 I'll be adding cup holders () and blacking out the rest of the interior. Suspension could possibly get the revamp I posted earlier. Definitely getting 2" hydro bumps but maybe 2.5" 14" Fox bypasses. We'll see. 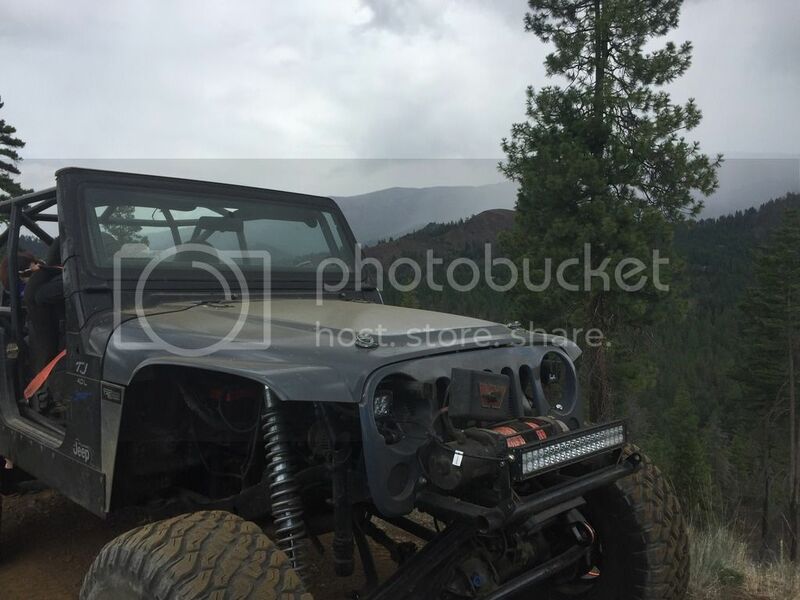 I am hoping this will tidy up the Jeep for the time being and I will call it pretty much "done" after this.